Cons: Despite his size, the junior runner has skinny legs that do not have a lot of power behind them. The best way to bring the back down is by wrapping up his legs. Another issue is that he doesn’t always protect himself from big hits by lowering his pad level; the former Volunteer prefers to slide or bounce off contact. That may work half the time at the next level, but Kamara needs to lower his shoulders more and reduce his tackling target. The young play maker missed two games with a LCL sprain this season, so this may be a situation to watch. His tendency to bounce plays outside is concerning along with his very subtle workload increase when Jalen Hurd left the Tennessee program, instead of a major increase in usage. If their coaching staff didn’t want him getting over 150 touches a season, do they know something NFL teams need to know? Pros: The back works well in space: gets tossed jet sweeps, goes to the flat in a hurry for quite a few screen passes, or just simply lines up in the slot. He uses combinations of spins, hurdles, jump cuts, juke moves, and quick feet to avoid defenders in the open field. His vision is one of the former Volunteer’s better attributes which helps him read his blockers and take better angles. 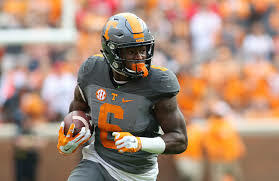 Kamara is one of his running back class’ best passing options with his soft hands that can adjust to the ball in the air while catching it in stride without losing concentration. As a pass protector, he steps up, squares his shoulders meeting the rusher head on and anchors for impact rarely getting knocked back. The runner has a good center of gravity that he uses alongside a mean stiff-arm to keep defenders at bay. His play reminds me a lot of current Patriot back, Dion Lewis, only Kamara is a bigger prospect, but has that same burst and slipperiness. Overall impressions: I like the young runner with his good vision, quickness, and burst. His limited touches could be considered a blessing (lots of mileage to go) or a curse (can’t handle a bigger role). Hopefully he will get better at protecting himself at the next level. Although I have him in my top five rookie runners, location may be a bigger determination of his true dynasty fantasy value. Kamara could be a value pick towards the end of the first round in rookie drafts. « RB-Marlon Mack-Can he be a lead back?